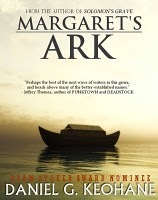 Author Daniel G. Keohane’s new novel, Margaret’s Ark, is now available everywhere. Here is the Amazon link, http://amzn.to/mVDVBg. For more information about Keohane and his books, visit his website, www.dankeohane.com. Keohane’s debut novel, Solomon’s Grave, was a finalist for the 2009 Bram Stoker Award for Superior Achievement in a First Novel. His short stories have been published in a variety of magazines including Cemetery Dance and Shroud Magazine. Many have received Honorable Mention in the Year’s Best Horror anthologies. He’s an active member of the Horror Writers Association and founding member of the New England Horror Writers.